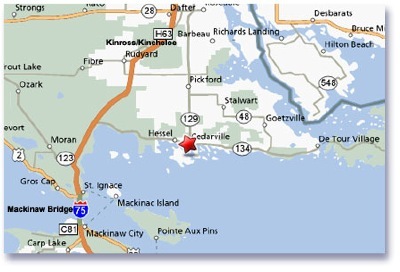 The Cedarville Lodge is located in the town of Cedarville , Michigan part of the Les Cheneaux island area. Out of town visitors can find us via I-75 North or South to M-134 (about 12 minutes north of the Mackinaw Bridge). Take Exit 359 and go East on M-134 about 20 minutes till you reach Cedarville. We are located on the left before the Yellow signal light at M-129. We are the Two story Hotel with a boat as our sign. Nearest Airport is Chippewa County Airport located in Kinross, Michigan. The airport is about 20 miles northwest of the Cedarville Lodge. Bus Service: The closest bus service is St. Ignace, Michigan there is a greyhound terminal located downtown St. Ignace about 35 miles west of the Cedarville Lodge.